Fresh and tasty fiddleheads are the first sign of spring and grow abundantly throughout Canada and parts of the United States from April to May. Fiddleheads are the young coiled fern leaves (about an inch in diameter) of the ostrich fern and their resemblance to heads of violins gave them their appropriate name. • Low in calories and virtually fat-free. • Excellent source of vitamin A. Look for small, bright green, tightly coiled fiddleheads and avoid ones that are yellowing or that are becoming soft. Carefully brush out and remove the brown scales. To remove this fuzzy papery brown covering or scales, simply rub between the palms of your hands. Rinse well before using. Tightly wrap fiddleheads in a plastic bag and refrigerate for up to 3 days. Prepare and serve fiddleheads as you would artichoke hearts or asparagus. Boiled or steamed. Make sure they are thoroughly cooked before serving -10 minutes for boiling or 20 minutes for steaming. If they are to be used cold they should be cooked first then cooled. Uncooked fiddleheads may contain toxins which can cause food poisoning. 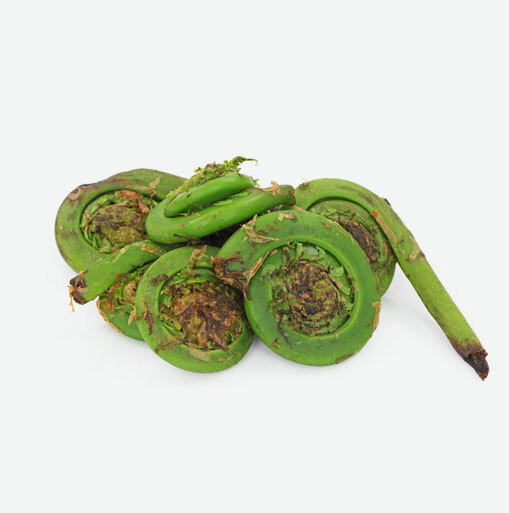 Top hot fiddlehead ferns with melted butter, a splash of lemon juice or a mild vinaigrette. Serve with roasted or grilled meats, over hot rice or as a side dish. Attractive fiddlehead ferns make an appealing edible garnish.